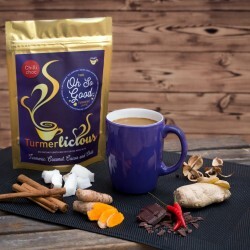 A divine way to take turmeric every day - hot drinks that are easy to make and deliciously indulgent. 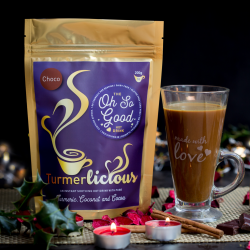 Maggie started making golden milk for her family of 5 boys after she heard about the benefits of turmeric, and experimented with different flavours to create a combination they all loved. After a few months of drinking it every day she noticed some changes in her family - no sniffles, coughs, colds, no more eczema, and they all had more energy and felt calmer. 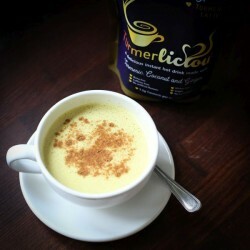 Her friends loved it too which inspired her to create Turmerlicious. 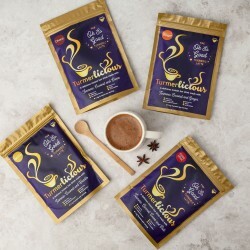 Based on ancient ayurvedic "Golden Milk", Turmerlicious is a soothing and delicious instant hot drink that contains a blend of turmeric and other spices that have been used for medicinal purposes for thousands of years in China and India, and boast many health benefits.